The PRINCE2 resource pack provides you with the essential PRINCE2 methodology materials you need. Consequently you can set your project quickly and keep it authentic. The resource pack includes a full set of PRINCE2 templates, the official ones under licence from AXELOS. PROJECT in a box also include additional templates and resources prepared by the author of the original template set. Therefore giving you consistency, these additional files are exclusive to PROJECT in a box. The resource pack also includes helpful resources such as links to glossary and process maps. With these you can help educate colleagues and keep your processes accurate. So when you need to apply the PRINCE2 Methodology to your new project you have all the tools you need. This method template is provided as standard on all versions of PROJECT in a box and developed in the house style with quick access to tools and other resources via the tab menus etc. To see the PRINCE2 methodology being used in the free Community Edition, watch the video on our site or You Tube. 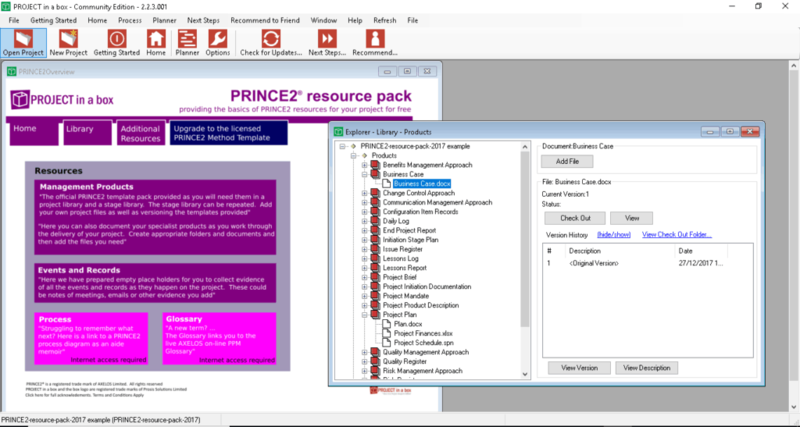 Of course the current version of the PRINCE2 resorce pack is now the 2017 refresh one. This one provides you with the latest official PRINCE2 templates, the only place you can get them for free! Need to include the PRINCE2© processes too? The PRINCE2 Method Template provides all the same materials with a few additional templates all prestructured into the PRINCE2 processes as per the manual including guidance hints and tips about responsibilities for updating products. This additional information makes a real difference to how you experience the PRINCE2 process, enabling you to focus on the products important at each process without constantly referring to your books! You can also find out how to purchase this from just £25 here. All PROJECT in a box packages provide the PRINCE2 Resource Pack 2017 as well as generic methods for your smaller less complex projects. All the methods include typical word type templates and more sophisticated templates/tools for project controls (risk, issue, quality, lessons, plans etc). You can also personalise/customise your methods (except on Community Edition). Free software to use as long as you want. Download here.